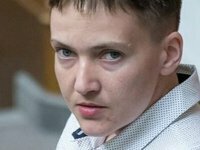 Eggs were hurled at Ukrainian parliamentarian Nadia Savchenko in Mykolaiv as she was meeting with city residents, the local media reported. According to NikVesti, representatives of nationalist organizations who were present at the meeting accused her of "working for the Russian administration" and started hurling eggs at her. That was followed by a fight. The police intervened in the situation. An ambulance came to the site.